In today’s post I would like to share details of how to create the Star Book, I showed you in February. 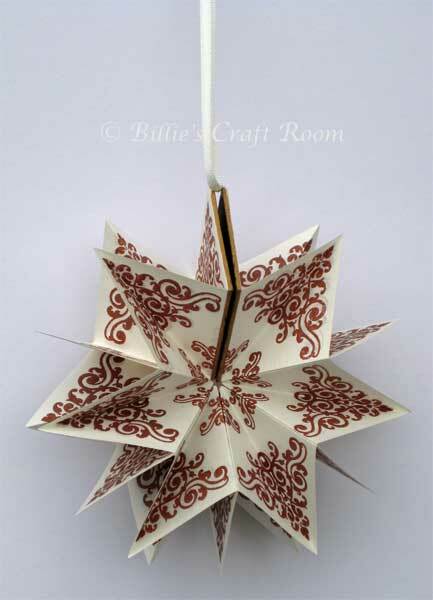 The star Book is a classic structure, with links to origami and also to book binding. It is quite simple to make and would be a very charming gift. With a different colour scheme this would also work as a hanging window ornament for Christmas. Would look wonderful in velum. Prit Stick, or glue compatible to the paper you used for your pages. A dry glue or double sided tape will prevent pages rippling. Ribbon. Colour to co-ordintate to your project. Here is my video demonstration, to show the stamping and assembly of the book. I was inspired by an original demonstration by Barbara Gray on Create and Craft TV of a very similar book to this one. My book features different stamps to the one Barbara demonstrated in the show, and I have modified her original stamping too. Clarity Stamp Barbara Gray’s excellent rubber stamp company. Graphicus also stock the Small and large sizes of the Ornate Corner stamps. I hope you have enjoyed the film, if you have any questions do leave me a comment. Thanks so much, I’m glad you liked the film and I agree these do make original personal gifts. I’m sure your sisters will love them. Look out for pear papers to stamp on, they really catch the light when used for a project like this. Have fun and do post me a link if you post a picture of your finished book. This is such a gorgeous book and I really like the way the stamped pattern connects through the whole book. Thank you for these videos, they are really clear and easy to understand, a great help! I have recently been sewing quite a few books and I heard about a tool called an awl gauge to hep prick all the holes in the pages. Do you know of anywhere which sells one at a decent price? For a comprehensive listing of suppliers around the world, check out my bookbinding tab. So glad you liked the tutorial and thanks for your comment and question. Another lovely tutorial and using the gorgeous Barbara Gray stamps – I have quite a few myself and particularly like her clever corners. Will be having a try myself on my next day off!! I forgot to ask about setting up a blog and I’ve just read your blog tutorials. I like the layout of your blog and am wondering if its wordpress – would you recommend them? Yes this blog is on wordpress. I LOVE WordPress, it is very versatile, has many layouts and so many options. Which blog host suits you, is very much a personal taste. Eblogger, Windows Live etc are very simple to use but have very limited options. WordPress has many different styles available, and more options to personalise the layouts. Visit http://wordpress.com/ to see the many styles available. This theme gave me the option of adding my own image to the area at the top of the page. I stamped the background photographed it and added text and other images in Photoshop. The colour scheme and text styles are locked to the style. But it is gentle on the eye and as my blog features lots of text it works for me. I tried other blog hosts but found unless all you want to do is add one photo and some text underneath, that was about as much as you could do. The other hosts wanted the photo top or bottom and then text. They didn’t like multiple photos in a post. Since I wanted to add many photos to support the tutorials these other hosts did not suit me. If funds allow at a later stage, I could go over to a paid website with wordpress and all that I have done so far would be able to ‘travel’ with me. A great advantage if I need to expand this idea at a later date. If you need any help or advice, I’ll be happy to try and help you. Bear in mind though that I am not really a techie, so html and the like is beyond me. I would recommend WordPress as an excellent blog host, their help pages are excellent and when I’ve posted a question or reported the problem I’ve had help within hours. Top marks on the back up front! Thanks so much. That’s really useful to know. I really like the layout of the wordpress blogs – they are really easy on the eye. I love your commitment to your blog . Thanks 🙂 It’s not my own design but one I’d seen demo’d. It’s quite simple to make up though. Thank you very much for this tutorial, the book is beautiful ! I made one for my Valentine ! You are most welcome, hope the person you made it for liked it. Great work on your snowflake ornament, thanks to you both for linking back to me. Love Ciaee’s daisy book too. I’m so going to try and make one of those.